New developers should read this before touching the source. "War is a product of anticommunication"
Communicate with other devs about your changes/fixes, let them understand the issue. Do not make 'random' changes. "Do not create work for other people." Have responsibility for your changes/commit. Do not leave bugs that require other people to fix. "Readability & performance are equally important." Don't code fixes that nobody wants to problems that don't exist. Create a folder games/zk.sdd in the Zero-K installation folder. Clone to desktop Zero-K game and save it to zk.sdd/. This folder should contain multiple files/folders, such as modinfo.lua. To test source modifications, you'll need to enable developer mode. Do this by creating an empty text document "devmode.txt" in the same directory as Zero-K.exe. You may need to restart the lobby. In the Settings menu a new tab appears: Developer. Edit the Singleplayer setting to be Zero-K Dev. Your skirmish games should now use your modified local copy of zk.sdd. Press F8 to open debug console. It'll display errors and output to the log. Create a folder games/chobby.sdd in the Zero-K installation folder. Clone to desktop Chobby and save it to chobby.sdd/. This folder should contain multiple files/folders, such as modinfo.lua. You may need to setup the database connection for the website. 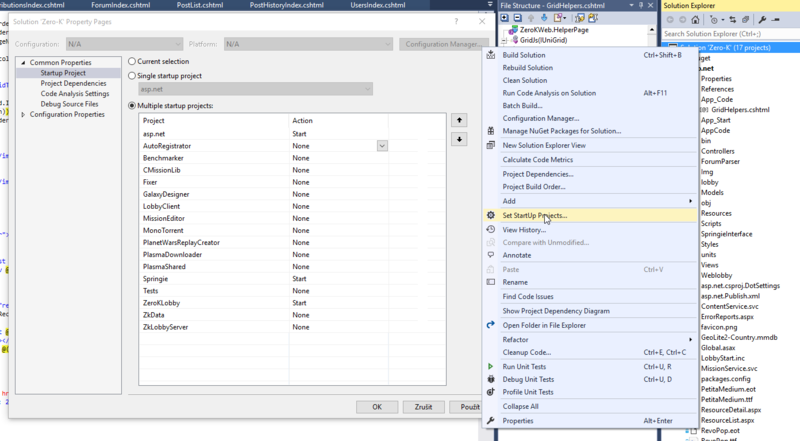 In order to do that: Open Visual Studio, open the Server Explorer panel, right click Data Connections -> Add Connection -> Sql Server. Enter (localdb)\mssqllocaldb in the Server Name field, after which zero-k_local will appear in the dropdown list of databases. To run a project right click it, choose "set as startup project" and hit F5 to run using debugger. It's required that you install MS SQL Express on your local PC. Get one from here. The file you will need is called SQLEXPR_x64_ENU or SQLEXPR_x86_ENU. Make sure you install version that matches your version of Windows (i.e. x86 vs x64). During the installation leave all the parameters default except that I changed server name to SQLEXPRESS in one of the first steps of wizard. Right click asp.net -> properties -> web -> check "Specific Page" and leave it blank. Otherwise you get errors when trying to host locally. Part of each unit page is autogenerated by the Unit Guide tool, and uploaded by the Wiki bot. Run export_unit_templates.sh to generate wiki templates for each unit (see export_unit_templates.lua for some configuration options), then have the bot read the generated text files and edit the unit pages accordingly (requires Visual Studio setup as detailed above). The text output can also be used to manually edit pages. Unit buildicons and radar icons should be uploaded by FTP to manual.zero-k.info (zero-k.info/zkmanual/www/unitpics and /icons respectively). Contact Licho or Histidine for login details. This page was last modified on 23 September 2018, at 02:17.